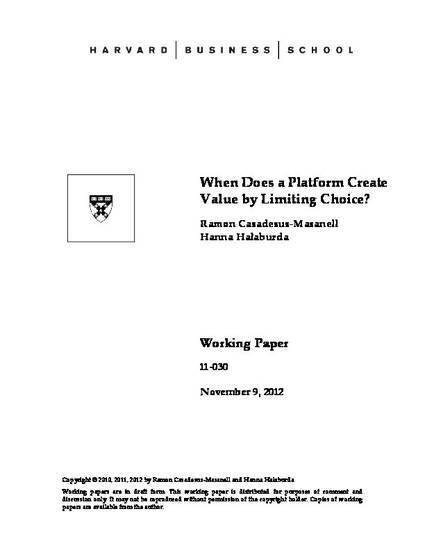 We present a theory for why it might be rational for a platform to limit the number of applications available on it. Our model is based on the observation that even if users prefer application variety, applications often also exhibit direct network effects. When there are direct network effects, users prefer to consume the same applications to benefit from consumption complementarities. We show that the combination of preference for variety and consumption complementarities gives rise to (i) a commons problem (to better satisfy their individual preference for variety, users have an incentive to consume more applications than the number that maximizes joint utility); (ii) an equilibrium selection problem (consumption complementarities often lead to multiple equilibria, which result in different utility levels for the users); and (iii) a coordination problem (lacking perfect foresight, it is unlikely that users will end up buying the same set of applications). The analysis shows that the platform can resolve these problems and create value by limiting the number of applications available. By limiting choice, the platform may create new equilibria (including the allocation that maximizes users' utility); eliminate equilibria that give lower utility to the users; and reduce the severity of the coordination problem faced by users.